Side of the Stag from the churchyard. 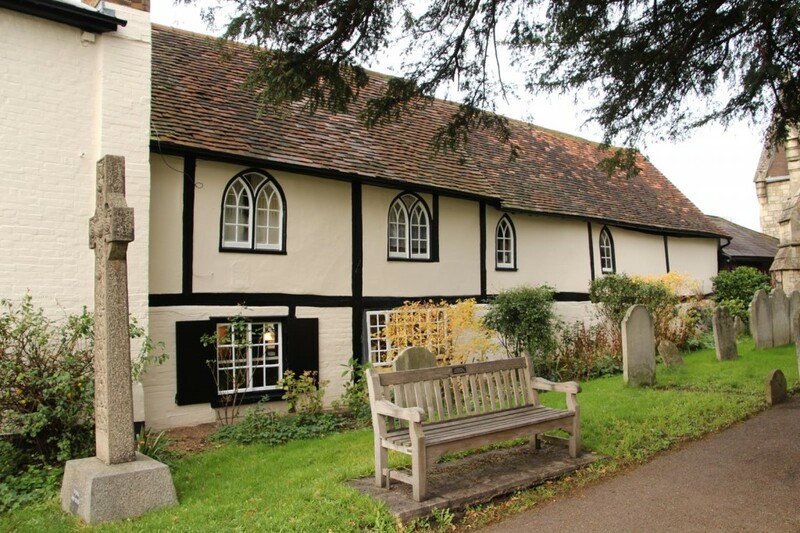 The lower windows date from the 1700s but the upper ones were inserted in the early 20th century; there are many others like them around Datchet. 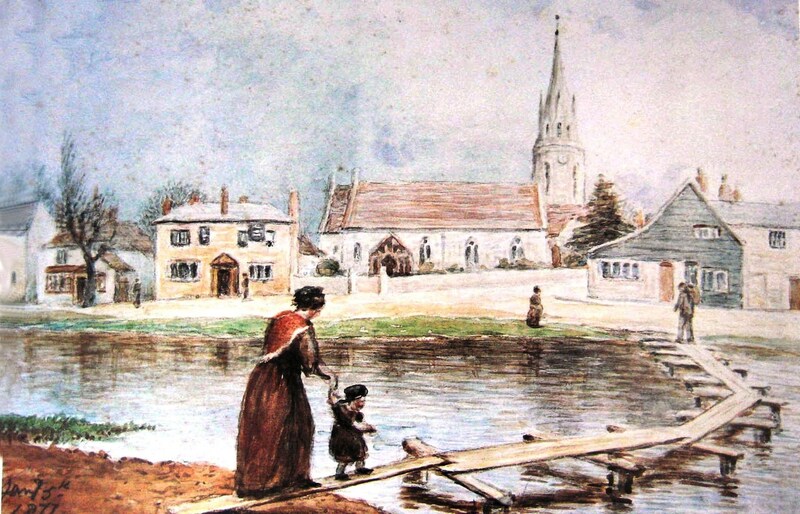 In 1570, during the reign of Queen Elizabeth I, several influential local men acquired a house which they would be able to lease out to provide funds for repairing the bridge, a very common solution to such a problem. 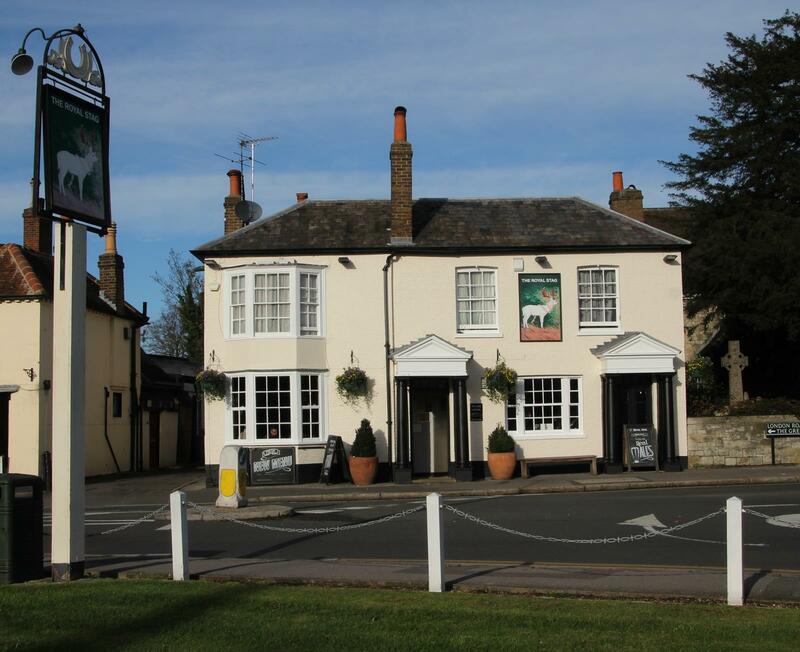 This house, which is still our Royal Stag, was from then known as the Bridge House although it also had a pub name, at first the Five Bells. Trustees were appointed from 1570 to administer the Bridge Trust, as their successors still do, and in the 1600s one of them was Robert Barker, Royal Printer. Before his death in 1644 he placed the Trust’s affairs on a sounder footing and from then it was known as ‘Robert Barker’s Bridge House Trust’. 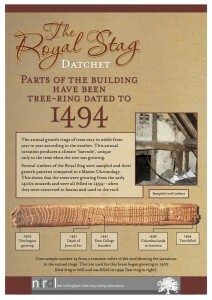 However, he was not the Trust’s founder as has usually been said, and it dates from 1570 rather than 1644. 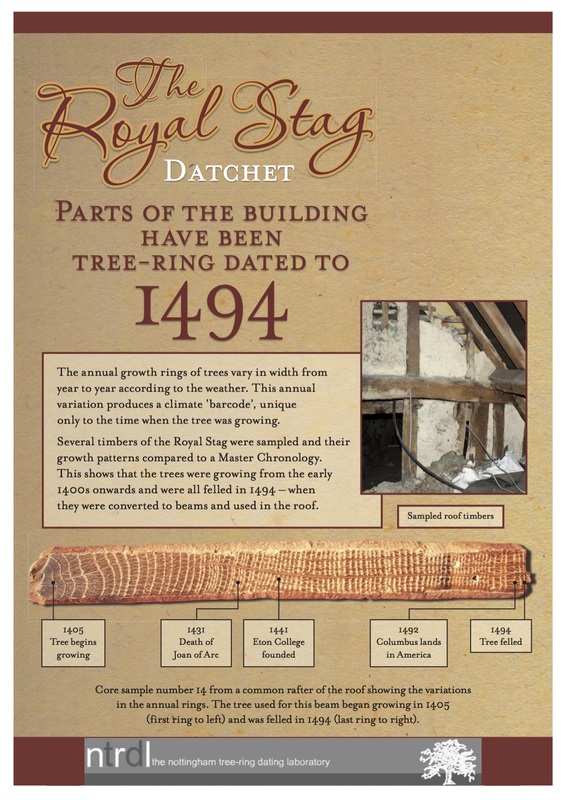 A great deal more is now known about the history of this building, because in 2011 the Trustees funded a full survey of its structure and scientific tree-ring dating of its early roof timbers. 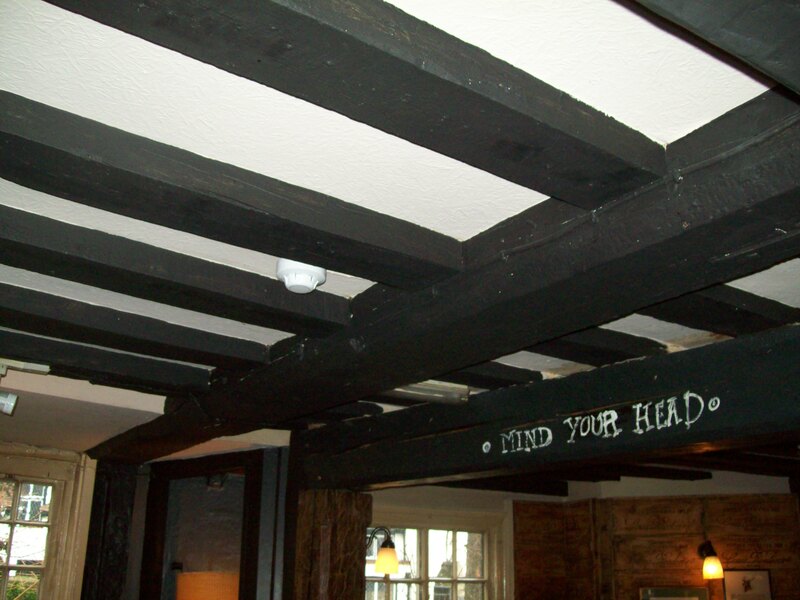 It was established that the old bar overlooking the churchyard (with two windows in each floor) was roofed with timbers cut down in 1494. Behind this is a longer range built in about 1600, its roof ridge not quite aligned with the earliest section. The Trust’s buildings expert thinks that the original house here had a front wing facing the road, as the pub’s facade does now, and that the early Trustees demolished that part as too dilapidated but kept the 1494 building behind it as still sound. 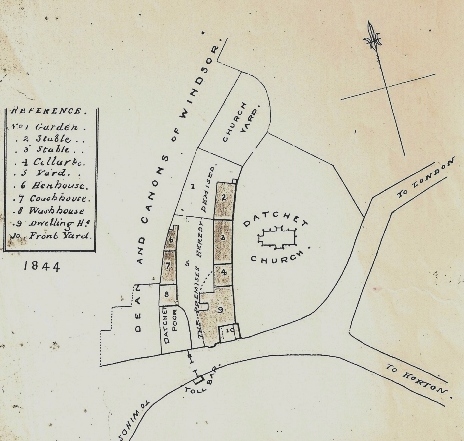 It was not until the mid-1800s that the front was extended out towards the road, firstly on the west side in 1843, and then in 1862 by another block at the eastern end of the front, a little wider than the old building. From the outside it is only doors and windows that have changed since then, but the interior has been remodelled many times. Until the 20th century the long yard at the side, now a car park, was lined with stables, a coach house, wash-house, henhouse and garden. 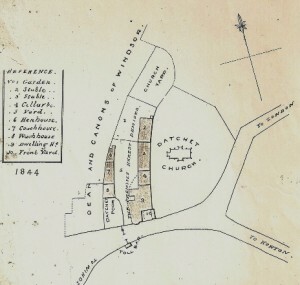 1844, the earliest plan. A front block had been added in 1843. 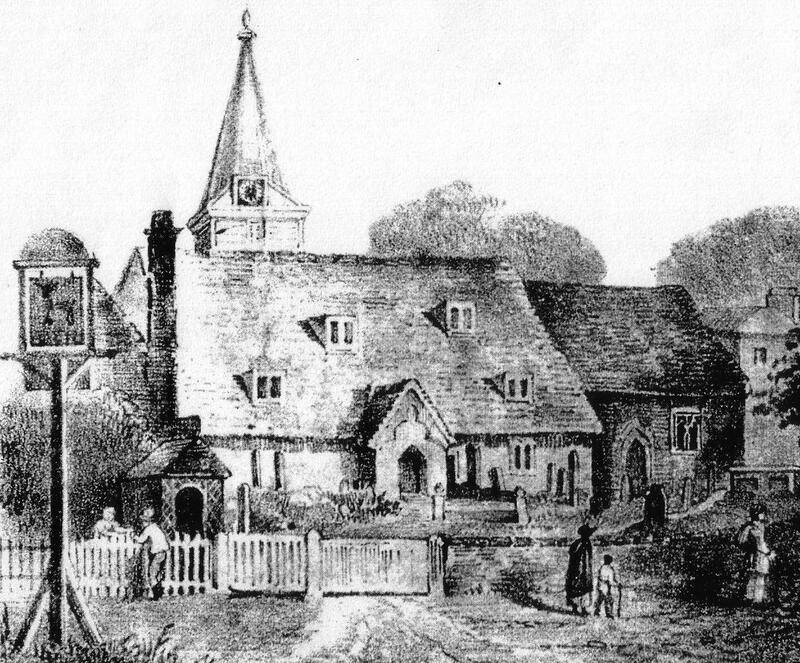 This early engraving shows for how long the Stag’s sign has existed in the same place it is now, but also the corner of the building adjacent to the church before the front block was built. 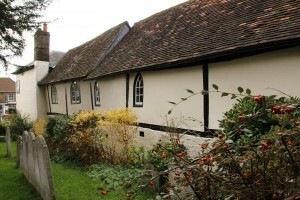 It can be seen that the gable-ended, timber-framed building is set back from the road with a small porch projecting into a small fence front yard, the same arrangement as in the 1844 plan (above). 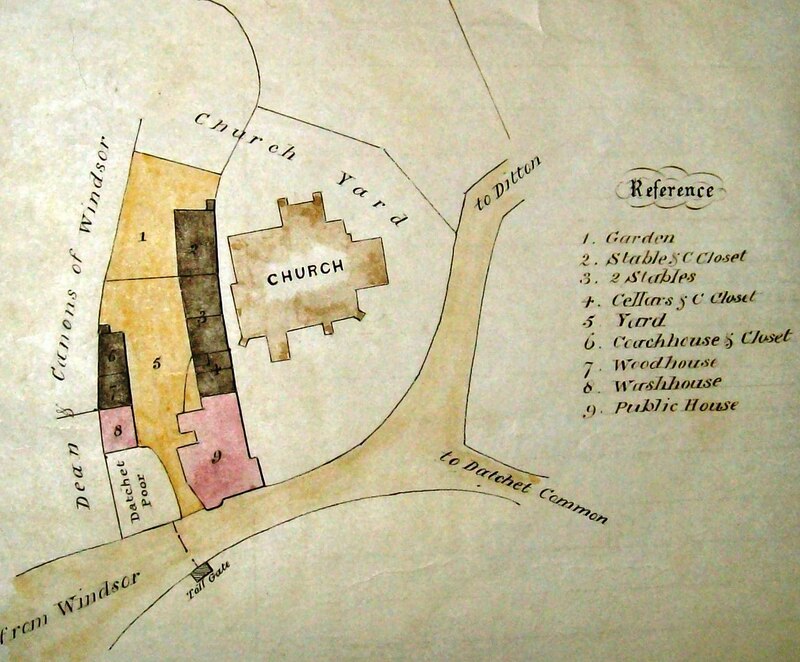 What a pity the artist was only interested in drawing the church and not the pub! 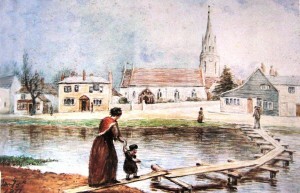 The Corden flood painting shows both front blocks completed, but only one entrance door in the centre. To the left is the parish shop, once almshouses and now The Bridge, with front window possibly as it is now. William Corden is not a particularly accurate artist, having omitted the Stag sign which was almost certainly in place. 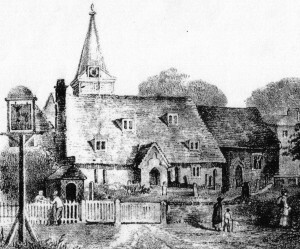 The church rebuilding had been completed in 1864, and the building on far right is the blacksmith’s workshop belonging to Church Cottage. In the course of 4 or 5 days all the household goods, telescopes and most of the contents of the work room stood ready loaded in the evening of July 30th for going off at two in the morning; my eldest brother (William) left Bath with the 11 o’clock coach which goes through Slough, where Alex (brother) and I joined him on the 1st August, from which having taken our dinner with the rest of the passengers we walked over to Datchet where we were obliged to sleep at the public house near the church, and were glad to see on our first waking the wagon with all the tubes etc etc safely arrived and we left our inn to see the wagon unloaded and all the furniture to be put in our new house. Caroline was obviously not impressed with the High Flyer, as it would have been called then. It seems that it was never of high repute but was just a village inn offering lodgings. We went a goodish way without coming across any more hotels, and then we met a man, and asked him to direct us to a few. He said, ‘You must turn right round and go back, and then you will come to the Stag.’ We said, ‘Oh, we had been there and didn’t like it – no honeysuckle over it’. Then George spoke up. he said Harris and I could get an hotel built for us if we liked, and have some people made to put in. For his part he was going back to the Stag. …… We took our traps (bags) into the Stag and laid them down in the hall. The landlord came up and said ‘Good evening, gentlemen.’ ‘Oh, good evening’, said George, ‘we want three beds please.’ ‘Very sorry, sir,’ said the landlord, ‘but I’m afraid we can’t manage it.’ Oh, well, never mind, said George, two will do.’ Harris thought George and I could sleep in one bed very easily. 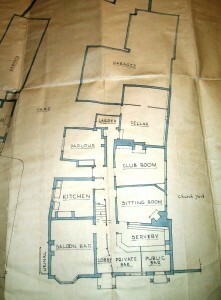 We picked up our things and went over to the Manor House …. But there was no room there either! 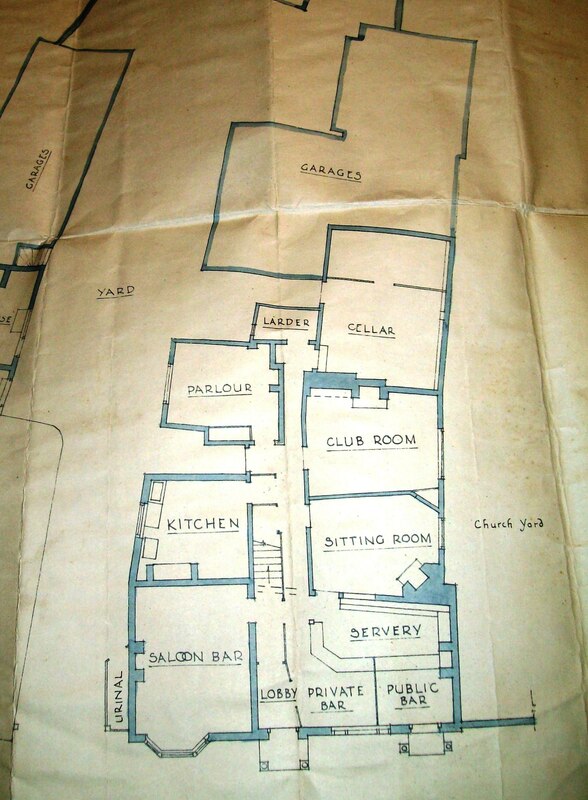 There really was both a billiard and a coffee room in the Stag at that date, as shown by plans and descriptions belonging to the Trust. In a place of honour in the Royal Stag at Datchet is a copy of a menu of a famous event which took place there 72 years ago, on September 5th 1892. It was the first annual dinner of a very famous printing company – the Kelmscott Press. The firm, noted for the many beautifully printed and bound private editions it produced, as founded the previous year by Mr William Morris who took the chair at this dinner. The story of a ghostly hand print appearing on a window pane, which cannot be removed and reappears if the glass is replaced, was not mentioned before about 1970. The window concerned is in the ground floor on the churchyard side. In 1979 a photograph was taken which is displayed in the pub, telling that it is reputed to be the hand print of a child who died outside in the churchyard while waiting for its father on a cold night. A Mr Smith claimed to have done research in Bucks Record Office which proved that this was the child of a drunken labourer at the end of the 19th century, but no such evidence exists at all. In true folklore fashion, the story has become elaborated, so that we are now told that the child watched the father become involved in a fight. For those who want to believe it, and for encouraging customers to the Royal Stag, the story is fine, but it is only a story with no basis in evidence. If the handprint reappears in the future, this researcher will be most intrigued and is prepared to eat her words, but currently remains sceptical. The broken tombstone in the rear bar is that of William Herbert, a maltster and brewer whose son John leased the tenancy of the Royal Stag. 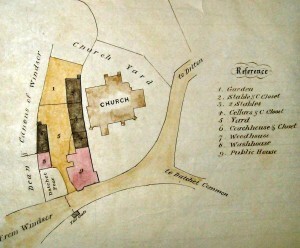 The family’s brewing business was probably on the site of the house now called Riverside, at the corner of Queens Road and the riverfront. At the time when the church was enlarged many tombstones were removed and some which were damaged were used as slab flooring in the pub. 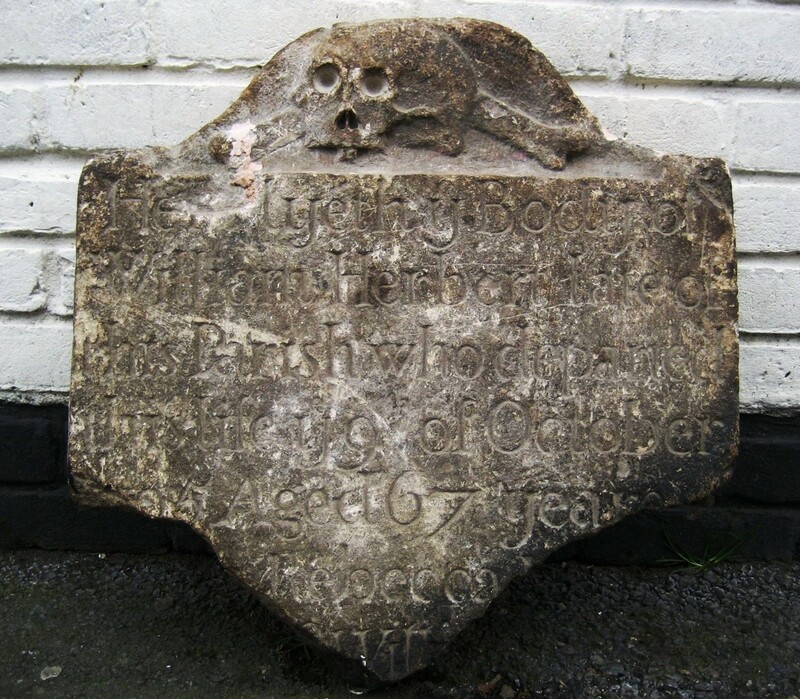 And there is nothing unusual or macabre about the skull and crossbones design, as a glance at the standing tombstones near the church porch will confirm, it was a popular momento mori, a salutary reminder of death in the midst of life.